The Sales Development Representative role has exploded in popularity over the past 10 years as software companies have bifurcated inside sales into closing roles and prospecting roles. The goal is to keep your Account Executives focused on qualified opportunities and let more junior reps filter the inbound leads and prospect into target accounts. The SDR role is also a great training ground for future AEs. In the constantly-evolving world of technology sales, it may be time to bifurcate outbound Sales Development by adding a research role to support outbound SDRs. SDR prospecting emails fill executive inboxes more than ever, and good SDRs know they need to earn their meetings with personalized outreach. The challenge is that some reps are now spending at least half their day doing research. As someone that receives these emails, I’m happy to see SDRs taking the time to personalize their outreach. But as an SDR manager, I’m also concerned SDRs are not spending enough time actually having conversations. Are we now ready to bifurcate the outbound prospecting role? Trish Bertuzzi, CEO of The Bridge Group, thinks we’re ready. In fact, she dedicated an entire chapter of her book, “The Sales Development Playbook” to this exact topic. Researching individual prospects and identifying customized research points takes time. Sadly, there’s no automatic “Perfect Message Generator.” If your reps have compelling events and key research points at their fingertips, they will have better conversations. Access and context are the primary reasons to consider the lead researcher role. If you want inexpensive labor doing Google searches, reading 10-Q reports, finding compelling events, and trying to see if any executives or board members have relevant connections, then interns could be your missing piece to scalable success. The Sales Development Representative is one of the very few positions in tech where hiring managers don’t look for someone already in that role. In fact, most SDR managers don’t want someone with 12-18 months of SDR experience because they assume that rep should have already been promoted or close to it. Instead, we sales managers hire from other industries and hope we make good decisions. Hiring sales reps has become a much more scientific process in recent years, but no interview process is as good as having someone actually be part of your team for 3 months. Hiring an intern gives you an opportunity to evaluate future SDRs based on work ethic, culture fit, and performance. If you’re impressed, you can extend an offer. 3) Faster hiring and ramping for new SDRs: You constantly have a pipeline of SDR candidates that can be promoted at any time. From the day an SDR headcount opens up until the day that SDR is consistently hitting full quota, you are losing hundreds of thousands of dollars in pipeline and potentially even millions. In the time it takes to post the job, interview candidates, do reference checks, make an offer, let the candidate put in their 2-week notice, spend a couple weeks in new hire training, and then take a month or two to ramp up to full quota, you’ve already lost 3-6 months worth of pipeline. Imagine if an SDR quits on Friday and you promote an intern over the weekend to take over that same territory Monday morning. This new SDR just spent the last several months learning your product, your market, your customer anecdotes, and listening to your sales team have conversations every day. Additionally, the intern has hopefully made a couple hundred calls and run through an email and social campaign of their own. In fact, why wait for someone to leave? You can evaluate your interns against your lowest performing SDRs. Some managers keep bottom performers on the team because they can’t afford the gap in productivity. How much more pipeline would you generate if you could replace your bottom 2 SDRs with individuals performing near the top? 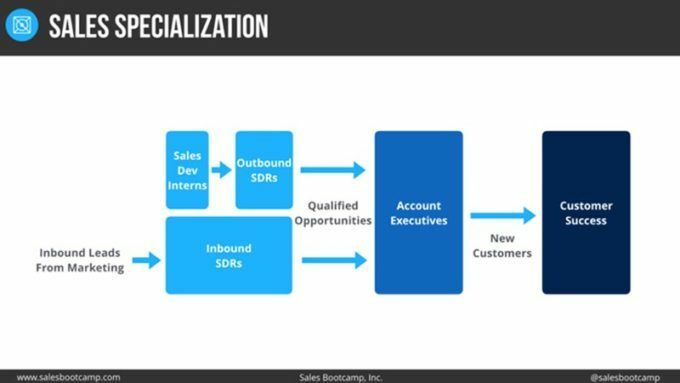 In summary, you should consider a Sales Dev Intern because your SDRs will be significantly more productive, you’ll have a superior vetting process for future SDR hiring, and you will exponentially accelerate your training and ramping time. Specialized skills are crucial in all areas of your business and it’s time Sales Development adds one more position to the team. I’m looking forward to seeing which sales leaders become early adopters and create this new role on their team.